The lovely Lily from BeautysBadHabit is doing another stint with us today and showcasing Illamasqua’s latest collection: Theatre of the Nameless – take it away Lily! Illamasqua have been at it again with their Autumn/ Winter collection, ‘Theatre of the Nameless’, being yet another which has had the blogosphere abuzz. Inspired by the dark, decadent creatures of ’20s Berlin who owned the night with illicit acts and wild looks, the ‘Theatre of the Nameless’ is an unapologetic nod towards Illamasqua’s original inspirations. To my surprise, when Charlotte received a few ‘Theatre of the Nameless’ items to review, she sent them my way since such ‘odd’ shades are pretty everyday for me! 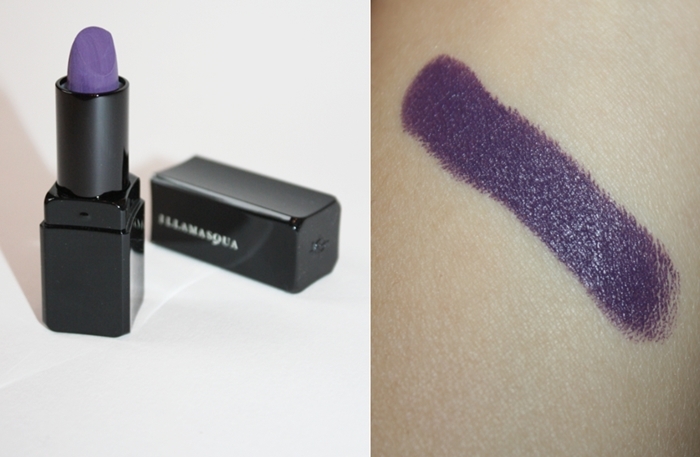 Especially lipsticks, with Illamasqua ‘Disciple’ (inky navy blue) being a firm favourite. 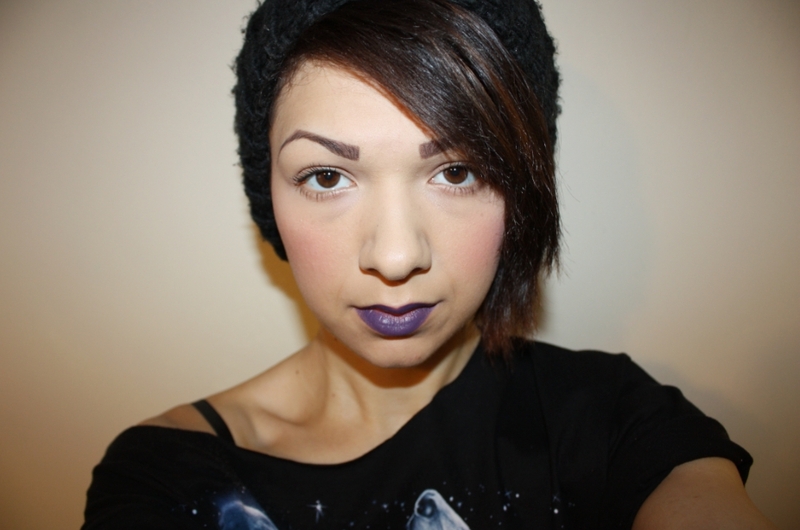 ‘Kontrol’ lipstick (£15.50) is a medium dark, blue toned purple with a twist of grey and extremely impressive pigmentation. One swipe and this baby is as opaque as they come. To me, ‘Kontrol’ is the perfect ‘night on the town’ colour if you’re a little…um…gothically inclined? Alternatively natured? Heck. If you’re up for wearing something more interesting or ‘edgy’ than primary red or hot pink – this is for you! I love ‘Kontrol’ with a strong, opaque, sharp application, but it also looks lovely dabbed on and coated with a sheer gloss for a more forgiving finish. This lipstick will last as long as you do, I’ve gone entire days (and then well into the night) wearing this without it fading or smudging – very impressive indeed! ‘Kink’ polish (£13.50) is one of four from this collection, all of which have the same ‘rubber-look’, waxy finish. The new texture (for Illamasqua at least, I recognise the finish as satin/ semi-matte) is bound to be love it or hate it with all who try it. Personally, I’m a fan, though my opinion may have been swayed by the gorgeous, deep green colour! ‘Kink’ was extremely thin (managed to drip it down my jeans – oops), opaque in two coats, fast drying and lasted two days before any chips appeared – which, for me, is average. The best thing? It’s called ‘Kink’. ‘KINK’. Who doesn’t want to say they have a bottle of ‘Kink’?! 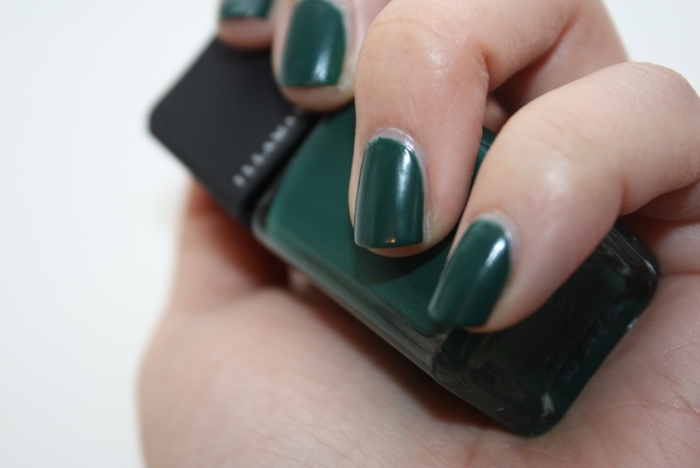 All in all, another fascinating and boundary pushing (green gloss – need I say more?) 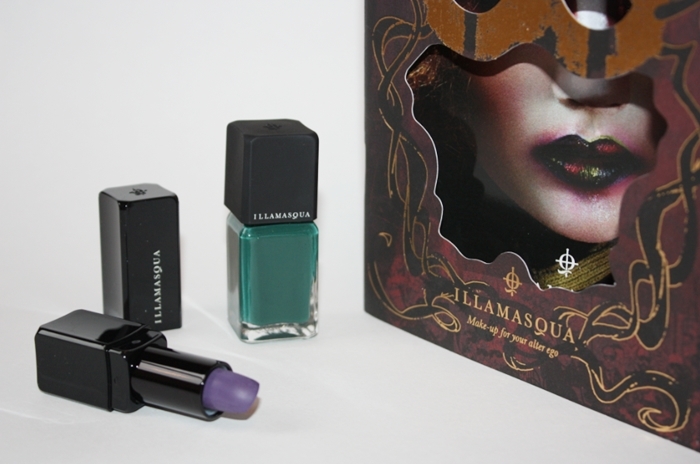 collection from Illamasqua, but by now – would we expect anything less? I have to have that lipstick! Looks gorgeous on you! Great review! I am in lust with that lipstick, I really am! I LOVED this collection, but I didn’t pick up the lipstick! I thought ‘oh I have a billion purple lipsticks already’ but this is very different compared to every other one I own. I think another order with this and the shimmer blushes is in order. As with most things Illamasqua, I adore this collection, even if it’s not every day fare for me! The Kontrol looks very pretty on you, Lily, and with the soft cheeks, it feels almost romantic rather than gothic. And what’s not to love about a rubber-finish varnish?